Snoozer Dog Beds, Car Seats, Carriers | Fan Photo Gallery! We’ve made lots of customers happy over the years —and their owners too. Let’s show the world with a pic of your happy pup enjoying his or her Snoozer. When you submit your “Snoozer Selfie” through our website, we’ll reward you with 20% off your next purchase. It’s our way of saying thanks for being a great customer and sharing the love with us. :) Show Us Your Snoozer Today! Too many photos for lightbox albums. Disable "Open albums in lightbox" as you have 2144 photos. This feature is only suitable for max 2000 photos! I ordered the snoozer pet car seat for my dogs and they love it and I love knowing that they're safe and secure buckled into the seat! 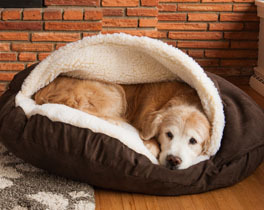 The best dog beds around! My Golden Retrievers snuggle in and even the cat keeps them company. Very durable and easy to clean. The products were beautiful, the quality was excellent and the delivery was very prompt. Your company is a real pleasure to deal with. Received the two items and they are fantastic! Quality is better than any other pet caves we have researched. Would highly recommend.